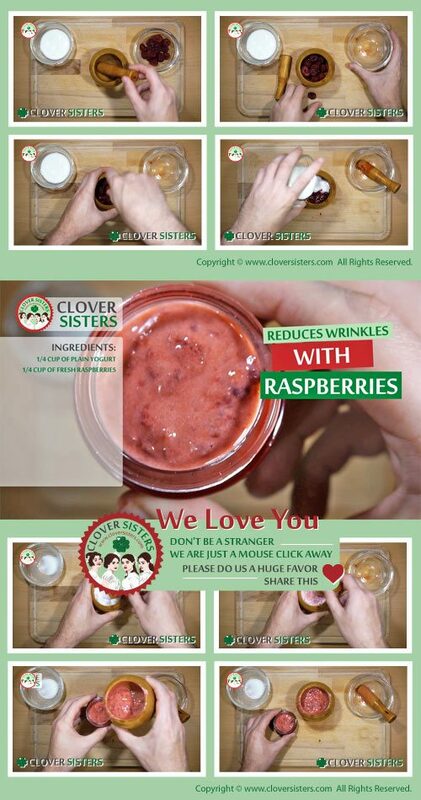 Humble raspberries are a natural way to improve your complexion for all skin types, even for the most sensitive. Used in many natural skin care products the red raspberries can be the magic bullets that will give you a great looking skin. It is a well known fact that raspberries are rich sources of omega fatty acids, which may be very beneficial for treating eczema and psoriasis. This skin tightening fruit have 10 times more antioxidants than tomatoes and high amount of anthocyanins. When it comes to a hair care, raspberries, as a rich source of B vitamins, biotin, vitamin C and folic acids are very effective and essential for resolving problems like a hair loss and graying. Worried about hair loss or thinning? Raspberries have ability to accomplish that mainly because they are rich in biotin, one of the B complex vitamins essential for the health of the hair. Because they are an excellent source of vitamin C, eat raspberries to keep your scalp in top shape and to protect your scalp from oxidative damage. Raspberries are rich source of B vitamin called folate. This vitamin is beneficial for healthy hair growth and if you eat enough folic acid hair growth will follow. Combine 1/4 cup of yogurt and half a cup of fresh raspberries. Blend to smooth the mixture. Apply daily keeping mask on for about 15 minutes before rinse.